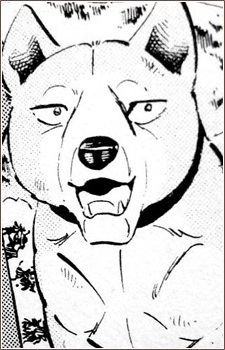 Shiro is a legendary bear-dog and is the father of Riki and the grandfather of Gin. For well over a year he and his master Gohei kill many big bears. His death is shown briefly in the Anime of Ginga: Nagareboshi Gin and he his mentioned a few times, but in the Manga Ginga: Densetsu Riki do we see his last battle. Shiro was fighting against Akakabuto and sacrificed himself by pushing himself and Akakabuto off a cliff, he saved both Gohei’s and Riki’s lives by doing this. His last words were telling his son to train harder and to take care of his master.